Product information "Grohe Concetto Kitchen tap with Pull out Spout (32663001)"
With the Grohe Concetto Kitchen Tap with Pull out Spout you can have function without sacrificing style. The sleek Concetto Kitchen Tap has features such as the 360° swivel range and pull-out function designed to make doing the dishes a breeze. Pots and pans easily fit underneath the tap, and combined with the pull out spout it's never been easier cleaning up in the kitchen. The GROHE SilkMove technology ensures continuous water pressure and temperature control, and the GROHE StarLight finish is bright, easy to clean, and durable. Effortlessly switch between fine spray and powerful jet to help clean even the toughest spots on your dishes. Make your kitchen work easier and more enjoyable and buy this tap today! 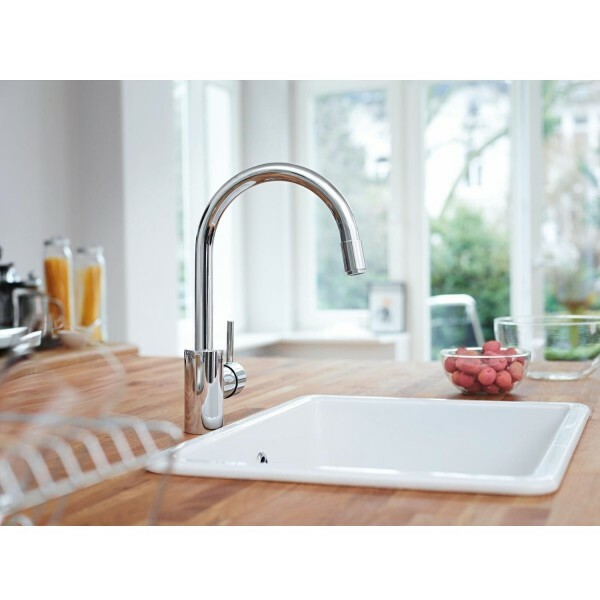 ⦁ Single lever mixer with chrome sink and extractable aerator. The Grohe Concetto Kitchen Tap is easily installed. Customer evaluation for "Grohe Concetto Kitchen tap with Pull out Spout (32663001)"